When stairs become a problem, a stairlift is the answer. 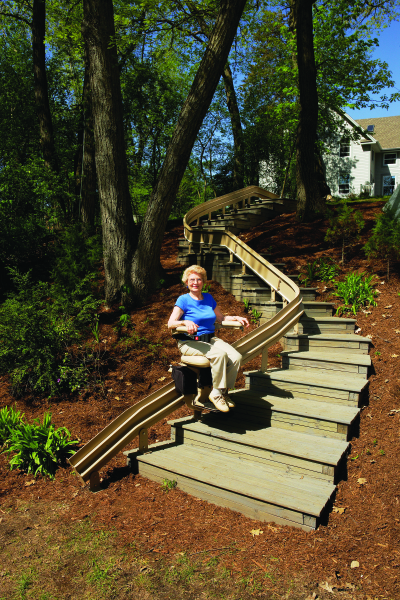 With the push of a button you can ride up & down the stairs while comfortably seated. * Battery powered to ensure lift will run even during a power outage * Folding seat - occupies less space when not in use. * Pair of remotes to operate the lift from the top or bottom of staircase. * Neutral-colored rail system & seat to complement your decor. * Built in safety features. * 5 year warranty limited to rail, motor, gearbox. Stairlifts within the Municipality of Anchorage also require an elevator permit/inspection to be approved for use. We will take care of all of the permitting requirements to ensure you have a safe and code-compliant lift system. Minimum staircase width is 33" wall-to-wall for residential units, some models require more space. There should also be approx. 24" of clear space at the bottom of the staircase for the lift to "park". We provide a free on-site visit to ensure the lift will fit, meet your needs, and satisfy code requirements. "Elan" 300 lb. capacity, public or private use lift. Options: folding rail at bottom (power or manual), up to 20' rail length, keyed remotes. Click the link for more information, downloads, photos, video, etc. "Elite" 400 lb. capacity, private-use lift. Options: public-use package, folding rail (power or manual), larger seat, keyed remotes, power swivel seat, power folding footrest, larger/wider footrest, additional upholstery options. Click the link for more information, downloads, photos, video, etc. The "Outdoor Elite" is 400 lb. capacity, public or private use lift. Options: rail length beyond 16 ft. Outdoor models needs to be cleared off to prevent ice & snow buildup on the rail system. Click the link for more information, downloads, photos, video, etc. Custom stairlifts are engineered and built to fit your curved staircase (90º, 180º, winding, spiral, etc.) This is particularly handy for the typical Alaskan split-level entry home. The rail system can wrap around the turn eliminating the need to transfer from one lift to another at the mid-landing. We have the most experienced team of installers for custom stairlifts in the state of Alaska. We usually need about 37.25" wall-to-wall width for a custom stairlift - our estimator can check your staircase to ensure the lift will fit and satisfy code requirements. Code requirements for public-use stairway lifts vary by jurisdiction. For public buildings located from the Knik River bridge to Potter's Marsh, the Municipality of Anchorage has jurisdiction; the project would have to go through the Plan Review Dept. at Building Safety; they can be reached at (907) 343-8301. Call us for information on other areas as needed. While stairlift does improve access for the mobility-impaired, it does not qualify as an ADA-compliant solution. A vertical platform lift, inclined platform lift, or elevator would be an ADA compliant solution. A stairlift is an economical access solution for many assisted living homes. We have installed many lifts in assisted living homes and can ensure you will have a code-compliant, safe lift system for your residents.